These small teddies are all wearing scarves to match their crochet baskets, so they look like they are ready for the cold winter months. So, I took a picture of some of the teddies on a cream blanket and they look rather like they are posing in the snow! Another very popular little bag, these are very easy to carry around and are loved by children of all ages (and some adults too). The baskets come in blue, shades of pink, or dark pink and cream. These small crochet baskets with a teddy inside are still priced at £4.00 for fairs and markets and make a lovely gift for all times of the year. Posted on October 25, 2018 November 13, 2018 by Silvi VealePosted in Handbags, Teddies in Baskets, Teddy in a bagTagged all ages, Crochet Bags, small bags, small teddy, Teddy Bags, Teddy Baskets. Hello Again From Teddy in a Bag! I have been very busy over the summer, attending craft fairs and, of course, making new bags for teddies. This picture is just a few of the new teddy bags I have made. And over the next few days, I will be sharing more. There are some old favourites and some new designs as well. All made with love and very reasonably priced too. Other news is that I now share an Etsy shop, called Elephant Sun Dog on Etsy, with my daughter, Crystal, who runs Little Gifts of Southsea. So, please have a look if you have the time. You can see some of the other items I make, as well as Teddy Bags (although there are more of those at the moment 🙂 ). We also run a shared blog called Elephant Sun Dog, where we talk about our craft makes and share crochet patterns too. So crafters might well find something they like there. But in the meantime, I will take some more pictures of the new Teddy in a Bag stock and tell you more about it. Posted on October 22, 2018 by Silvi VealePosted in Backpacks, Handbags, Little Bags, Shoulder Bags, Teddy in a bagTagged all ages, Children's bags, Crochet Bags, Teddy Bags. I have been very busy lately, making new bags for Christmas Fayres, so updates have been quiet. You can actually see some of the bags I have made recently on the Teddy in a Bag Instagram feed, posted in the sidebar here as well. But to keep you updated, here is a picture of the Teddy in a Bag display at the Salvation Army Christmas Fayre, this last Saturday. As you can see, there are plenty of bags, all different sizes, some crochet and some cotton and many in Christmas colours (and all with teddies in of course). The elephant print bags are particularly popular (elephants and teddies, what more could you want! 😉 ) and I have found a nice range of cotton fabric to make very pretty bags for Christmas gifts. The next Christmas Fayre that Teddy in a Bag has a stall at is this coming Saturday (25th November), at the Love Baffins Fayre, in Tangiers Road, Portsmouth, so I’d better get back to making more bags right now! Posted on November 20, 2017 by Silvi VealePosted in Backpacks, Christmas Fairs, Cotton Bags, Handbags, Little Bags, Shoulder Bags, Teddy in a bag, Tote BagsTagged all ages, backpack, Children's bags, Christmas Fayres, cotton, Crochet Bags, medium bags, Older Children's Bags, Shoulder Bags, small bags, small teddy, Teddy Bags, tiny teddy. Another of our popular medium-sized bags is our Tote/Handbag. The bags are hard wearing and fully lined and each has a front pocket with a tiny teddy nestled inside. This one is in lilac and purple and is nice and bright and useful for everything from carrying toys to carrying pencils, pens and other stationary, or, for an older teddy lover, more grown up items. 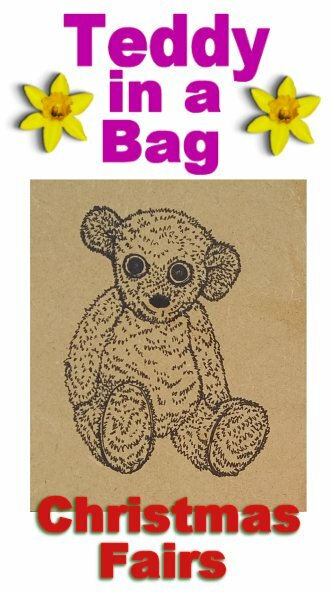 The tote bag with tiny teddy is suitable for all ages over three years old. Posted on October 2, 2017 September 28, 2017 by Silvi VealePosted in Handbags, Teddy in a bag, Tote BagsTagged Crochet Bags, medium bags, Older Children's Bags, Teddy Bags, tiny teddy. Following on from our new Candy pink bag, here is our Pale Rose Pink Small Bag with multi pink large pocket. And just to show that the pockets on these small bags are ideal for a small teddy to nestle up and sleep in, here is one of our 5 inch small teddies hiding almost completely in the front pocket! All small bags in this style are for sale at £5.00 each. Posted on October 1, 2017 September 28, 2017 by Silvi VealePosted in Handbags, Little Bags, Shoulder Bags, Teddy in a bagTagged all ages, Crochet Bags, Shoulder Bags, small teddy, Teddy Bags.